Innovation and collaboration takes many forms at ‘Big Blue,’ including countless Intranet 2.0 tools such as thousands of wikis, blogs and the increasing popular Beehive. 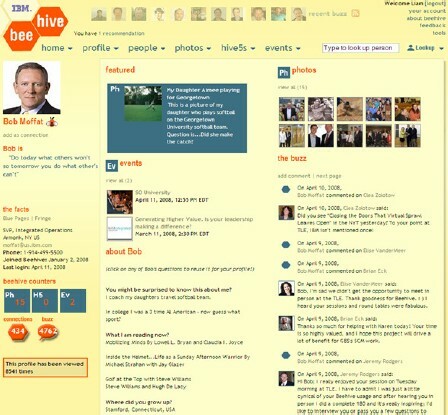 Beehive is akin to Facebook, but slightly different. It is an employee social networking site. Bees can also host events and create an event page that invites others to attend (think Evite.com). Beehive enables IBMers to track friends and share social activities. When an IBMer becomes a bee they get a profile page and at any time can update their status. New users are called ‘new bees’ and accumulate points for activity, including posts, comments and photos. As you accumulate points, IBMers grow from a new bee to a working bee, to a busy bee, and finally, a super bee. Over 30,000 people have opted-in, sharing over 40,000 photos in less than a year since Beehive issued its first honey. And it’s still being enhanced. To learn more about the IBM intranet and to see the Intranet Insider case study webinar, you can purchase a CD of the webinar from Communitelligence.com, which includes a 70-minute Flash recording of the session as well as separate audio and handout files. For more information on creating a social media strategy for internal audiences, check out Prescient's Intranet 2.0 Blueprint and download our updated Social Media Checklist.